How to Use Textual Analysis? Current: How to Use Textual Analysis? OTV is a company which delivers online TV broadcasting services. It is going to improve its services by re-developing the online broadcasting system. In this tutorial, we will make use of textual analysis to identify main use cases of OTV's online broadcasting services, and form a use case diagram for further studies. Download the attached document file OTV.txt, which describes the general business operations of OTV in advance. 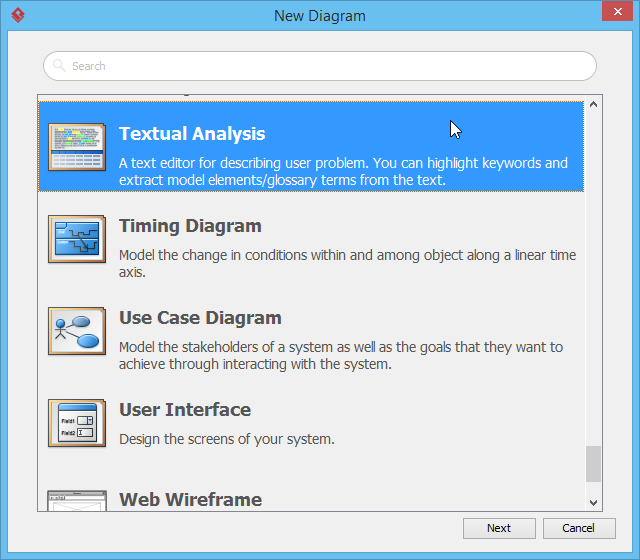 In the New Diagram window, select Textual Analysis and click Next. Click OK again to create a problem statement. You can enter the problem statement in problem statement editor. Choose either type directly there, or import a text file. Let's try to import the downloaded text file. Click on the button Import File, select OTV.txt and click Open button. The text is imported. Study the problem statement. Now, identify all candidate actors that involve in the system. By reading the problem statement, we find the first candidate actor, premium member in the second paragraph. Highlight and then right click on it, and select Actor from the pop-up menu. Check out the grid at the bottom. 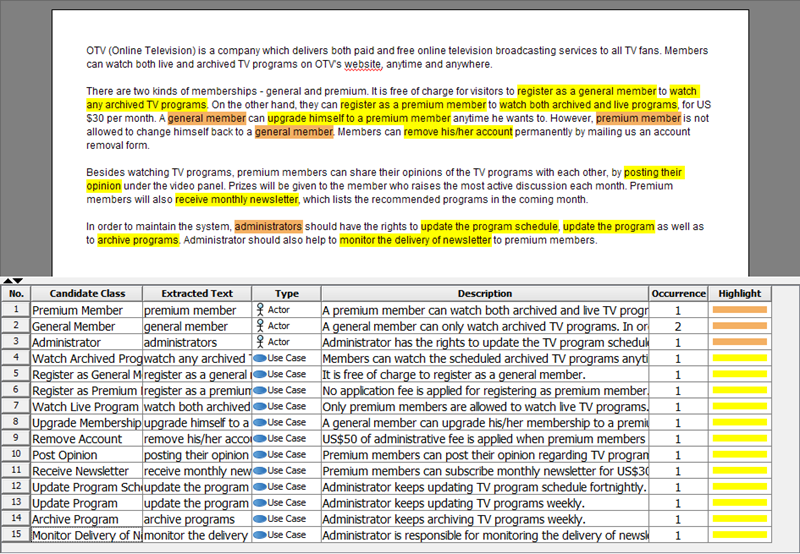 It lists the properties of extracted candidate object: Candidate Class (candidate object's name), Extracted Text (the word/ phrase it extracted from), Type (candidate type), Description, Occurrence (the number of times the word/ phrase appears in the problem statement) and Highlight (the highlight color of candidate object). The second candidate actor general member is found. Again, add it as candidate actor. In the last paragraph, we find the candidate actor administrator. Add text administrators as actor. Now, identify candidate use cases. Candidate use cases usually name as a verb or verb+noun phrase. For instance, "watch any archived TV programs" in the second paragraph. Highlight and right click on "watch any archived TV programs", and select Use Case from the pop-up menu. In order to distinguish the candidate objects in problem statement, we can change their highlight color. Let's select orange as the highlight color for candidate actors. Click Highlight cell of premium member and press the inverted triangle. Select orange from the combo box. You may notice that some of the candidate actors and use cases can be renamed to make them shorter and more informative. 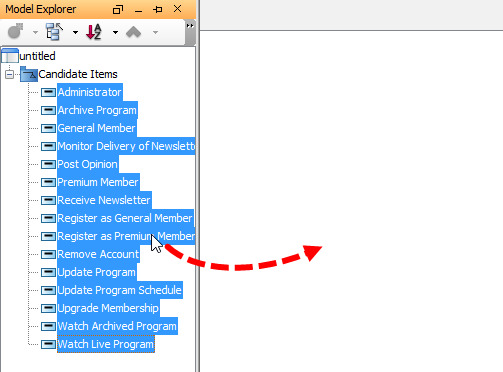 Take candidate actor premium member as example, to rename a candidate actor, in the grid at the bottom, double click on premium member cell under Candidate Class and change it to Premium Member. On the other hand, you can enter description for Premium Member. The text you typed in Description cell will become the documentation of Premium Member actor. For example, enter "A premium member can watch both archived and live TV programs for US $30 per month." General Member general member A general member can only watch archived TV programs. In order to watch live programs, s/he should upgrade his/her membership to be premium member. Administrator administrators Administrator has the rights to update the TV program schedule, update and archive TV programs. S/He is responsible for mentoring the deliver of newsletter to premium members. Watch Archived Program watch any archived TV programs Members can watch the scheduled archived TV programs anytime. Register as General Member register as a general member It is free of charge to register as a general member. Register as Premium Member register as a premium member No application fee is applied for registering as premium member. Watch Live Program watch both archived and live programs Only premium members are allowed to watch live TV programs. Upgrade Membership upgrade himself to a premium member A general member can upgrade his/her membership to a premium member. Remove Account remove his/her account US$50 of administrative fee is applied when premium members remove their account. Post Opinion posting their opinion Premium members can post their opinion regarding TV programs on OTV's official website. Receive Newsletter receive monthly newsletter Premium members can subscribe monthly newsletter for US$300 per annum. 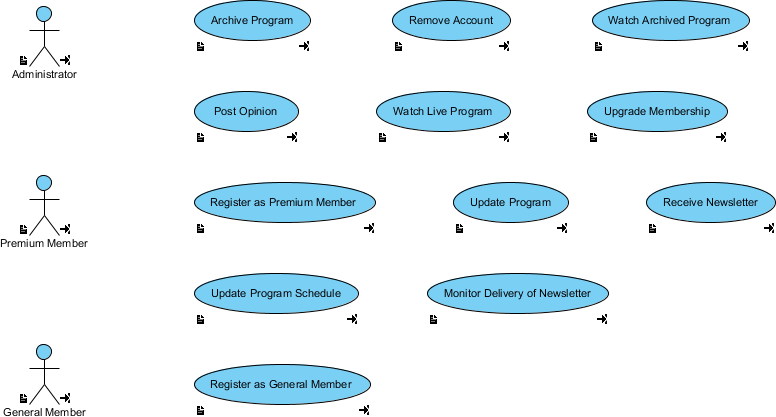 Update Program Schedule update the program schedule Administrator keeps updating TV program schedule fortnightly. Update Program update the program Administrator keeps updating TV programs weekly. Archive Program archive programs Administrator keeps archiving TV programs weekly. Monitor Delivery of Newsletter monitor the delivery of newsletter Administrator is responsible for monitoring the delivery of newsletter. Let's switch to candidate pane by clicking Candidate Pane View button. Candidate pane view is where you can visualize candidate objects for easy arrangement. We are going to form a use case diagram with those candidate objects. Create a use case diagram first. Select Diagram > New from the application toolbar. 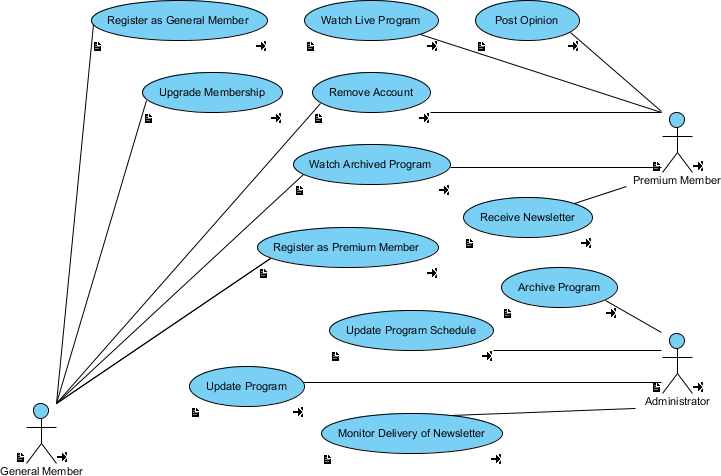 In the New Diagram window, select Use Case Diagram and click Next. Then, click OK to create the diagram. Open the Model Explorer. Select View > Panes > Model Explorer from the application toolbar. Select all the candidate actors and use cases. Then, drag them onto the diagram.